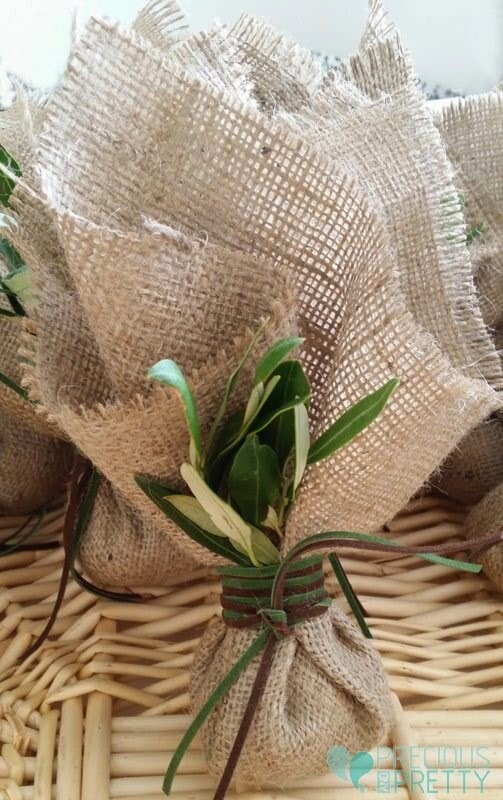 The burlap with fresh olive leaves is one of our favorite wedding favors. Their simplicity, combined with the colors of nature, creating a stunning effect. We made them with burlap, 7 sugar coated almonds wrapped inside with tulle and two suede type cords in olive green and brown colors. A fresh leaf beautifully adorns the wedding favor. It matches perfectly with rustic or olive themed weddings. PLEASE NOTE that in the picture the favor has been decorated with fresh olive leaves. Due to the fact that leaves can't remain fresh for more than 3 days, in the order that you will receive the leaves will be dried. The size and the quality of the olive leaves depend on the plant and on the season. The olive tree is the symbol of fertility and peace. https://www.preciousandpretty.com/2015/02/greek-burlap-wedding-favors-g168.html Greek Wedding Favors|Orthodox Crowns|Stefana|Baptism Invitations Greek burlap wedding favors G168 Burlap favor bags for rustic or olive themed wedding made in Greece Product #: Greek Wedding Favors|Orthodox Crowns|Stefana|Baptism Invitations_2092365266708765074 5 stars out of 5 reviews.